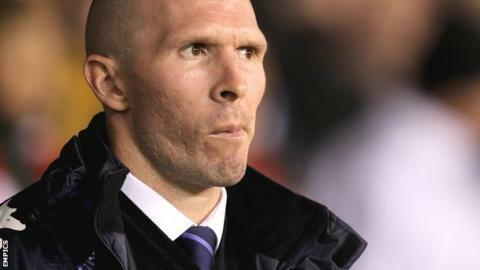 Michael Appleton secured his first league win as Oxford manager as the U's beat 10-man Accrington. Danny Hylton scored his sixth Oxford goal of the season from debutant Brian Howard's pass to put the hosts ahead. Managerless Stanley levelled as Marcus Carver turned in Piero Mingoia's shot from close in, but Michael Collins' 35-yard strike restored the hosts' lead. James Gray lashed out at Joe Riley to see red before Tyrone Barnett sealed Oxford's win from a weak backpass. Oxford's first win of the season lifts them out of the bottom two in League Two and up to 22nd place. Accrington also move up a place on goal difference, despite their defeat at the Kassam Stadium. Match ends, Oxford United 3, Accrington Stanley 1. Second Half ends, Oxford United 3, Accrington Stanley 1. Attempt missed. Kal Naismith (Accrington Stanley) right footed shot from outside the box is too high from a direct free kick. John Mullins (Oxford United) is shown the yellow card. Attempt missed. Junior Brown (Oxford United) right footed shot from the right side of the box is just a bit too high. Foul by Alex Jakubiak (Oxford United). Attempt missed. Junior Brown (Oxford United) right footed shot from the right side of the box is too high. Corner, Oxford United. Conceded by Kal Naismith. Corner, Oxford United. Conceded by Robert Atkinson. Substitution, Oxford United. Carlton Morris replaces Tyrone Barnett. Junior Brown (Oxford United) wins a free kick in the attacking half. Substitution, Accrington Stanley. Shay McCartan replaces Marcus Carver. Attempt missed. Tyrone Barnett (Oxford United) header from the centre of the box is close, but misses to the right. Corner, Oxford United. Conceded by Dean Winnard. Attempt missed. Kal Naismith (Accrington Stanley) right footed shot from outside the box is high and wide to the left. Nicky Hunt (Accrington Stanley) wins a free kick in the defensive half. Goal! Oxford United 3, Accrington Stanley 1. Tyrone Barnett (Oxford United) right footed shot from the centre of the box to the bottom right corner. Attempt missed. Callum O'Dowda (Oxford United) right footed shot from outside the box is close, but misses to the right. Attempt missed. Josh Ruffels (Oxford United) left footed shot from outside the box is close, but misses to the right. Attempt missed. Alex Jakubiak (Oxford United) right footed shot from the centre of the box is close, but misses to the right. Substitution, Oxford United. Alex Jakubiak replaces Brian Howard. Foul by Tyrone Barnett (Oxford United). Substitution, Accrington Stanley. Josh Windass replaces Piero Mingoia. Substitution, Oxford United. Junior Brown replaces Danny Hylton because of an injury. Corner, Oxford United. Conceded by Nicky Hunt. Attempt missed. Callum O'Dowda (Oxford United) right footed shot from the left side of the box misses to the right. Attempt blocked. Tom Newey (Oxford United) right footed shot from the centre of the box is blocked. Attempt missed. Tyrone Barnett (Oxford United) header from the centre of the box is too high. Attempt missed. Marcus Carver (Accrington Stanley) right footed shot from the right side of the box is high and wide to the left. Corner, Oxford United. Conceded by Luke Joyce.